The same as last year, we had a pleasure to participate in Microsoft Future Decoded – the biggest event organized by Microsoft in the UK. It has a form of a conference, where a lot of interesting speakers from Microsoft and its partners share their achievements, case studies and findings. Moreover, this is a place where Microsoft shares a lot of information about innovative projects they run and new products they offer to let us know what comes next. The second face of the event is an exhibition area, where Microsoft and partners present their capabilities and products. 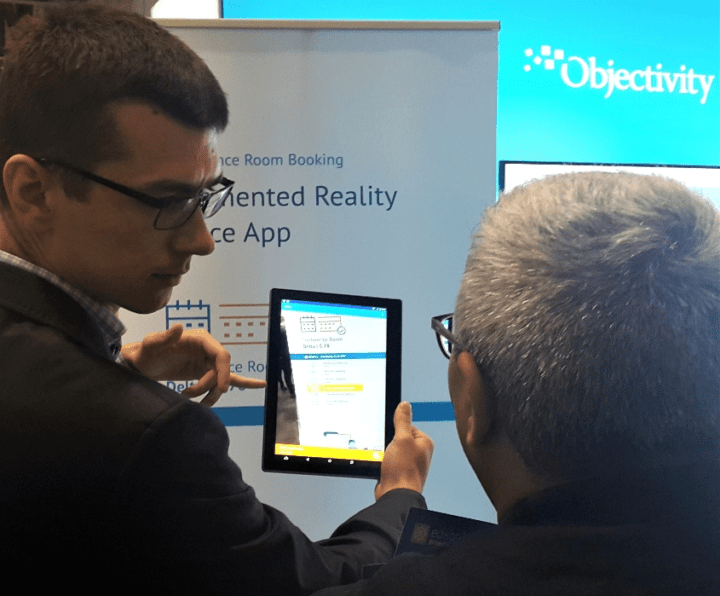 Objectivity had its delegates present at the conference as well as exhibitors showing its capability to solve complex business problems using new technologies. Please take a moment to find out how Future Decoded 2017 looked in my eyes. Some of us had arrived a day before the event to prepare the stand and check the cabling setup and if demos were working fine (see Pic.1). In total, it took us around 5h to make sure all was OK. This year, we were presenting our capability to solve business problems using the following technologies: Augmented Reality, IoT and Bots. Augmented Reality Office App is to improve ad-hoc meeting reservation in the offices. With this application, you can use your mobile device – a phone or tablet, point it to the wall were the name of the room is imprinted, and below that name our AR application will display that meeting room calendar getting data from Microsoft Exchange. You can immediately book your meeting if there is a free slot available. There is no need to go back to your desk and check rooms’ availability on your computer. In addition, can you imagine the cost savings when you do not need to run cabling and mount the devices in front of the meeting rooms to display its calendars and schedules? (On Pic.2 you can see @Blazej Gwozdecki presenting this application to one of the visitors at Objectivity’s stand). Pic. 2 Blazej Gwozdecki presenting AR Office App and integration with MS Exchange. 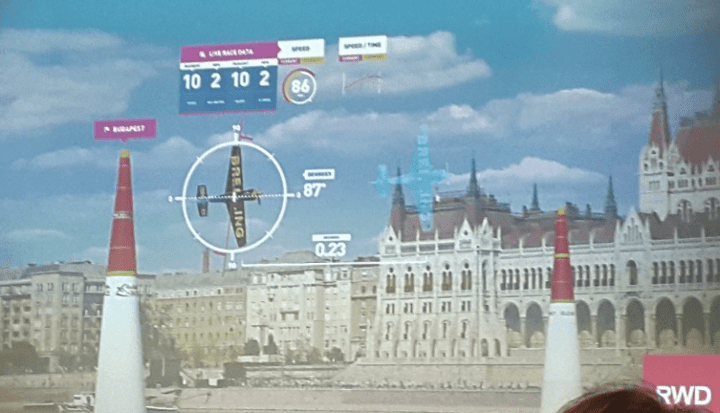 Objectivity has also presented a bit more complicated scenario using Augmented Reality and IoT asset monitoring, predictive maintenance and machine learning capabilities. 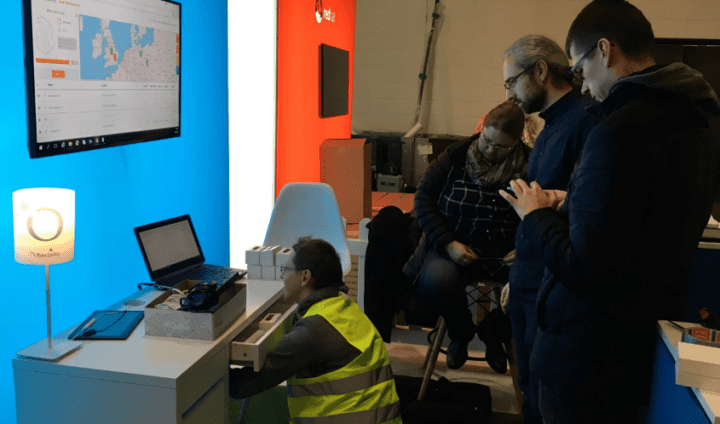 On the top of the demo we did last year, we have improved the experience of the Technical Engineer responsible for maintenance and reparation of devices using AR. While the object (3d marker) is recognized as an asset and identified, the data related to it is displayed above the device, presenting its RAG status and main parameters’ updating in real time while the device is working. If there is a fault or malfunction, the application displays RAG status RED and most probable solutions for this error taken from the Knowledge Base. As a result, the engineer can solve the problem and repair the device faster, minimizing its down time. We strongly believe it has a great future in the manufacturing and maintenance services, whenever there is a need to fight with time to secure SLA. See Pic. 3, I can’t wait to make it work on HoloLens!! We have presented that it is possible to use a business card as a marker and, once you point the AR application to it, the video about Objectivity is being played. The possibility to switch a lamp on and off remotely using our AR application was also very interesting to our audience. Once again, you can save a lot of effort and costs related to running cables and installing switches by using a sticker as a marker instead. Whenever you want to turn the lamp on/off (or any other equipment), you can use our AR application, point it to the marker and switch on/off a particular device assigned to the marker. To do this, we have used a WiFi power switch paired with the marker. By the way, it is also possible to switch the same lamp on/off using our Scales Bot (writing in Skype or talking to it). You can see the stand and our crew during exhibition on Pic. 4. Pic. 4 Many parallel presentations on our stand. From the left: Jacek Parfianowicz and Blazej Gwozdecki presenting. In the middle, Adam Fenwick discussing with visitors. On the right side, you can find Jon Finn and Justin O’Dwyer. Has the future been decoded by exhibitors? 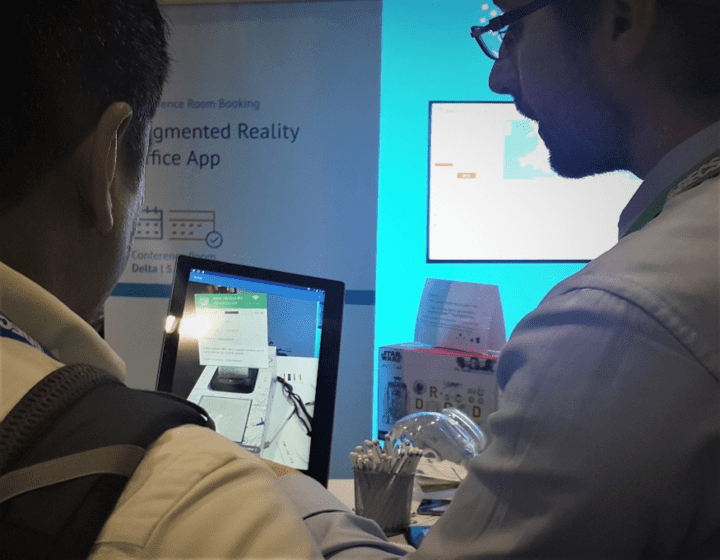 I was disappointed when I noticed that only Microsoft and Objectivity were showing a real business application of Augmented Reality (or something equally fascinating). Most of the presenters were showing their capabilities of integrating with the cloud, transforming the infrastructure and business to the cloud, building something in O365… There was one company showing bots that focus on resetting password for the user, who had blocked their account in domain. CGI had a nice Transformer – but I liked it until someone told me there was a human inside :(. I expected a lot more of the future and a lot more of new technology implementations in solving business problems than I saw. Of course, a lot of exhibitors had prepared many give-aways, sometimes I felt like in an amusement park. Keynotes and presentations cheered me up. There were several keynotes I liked, but only a few I loved. I will start from Project Emma <Build 2017: Project Emma>. A perfect illustration of how we all should look at our daily tasks, looking for real life changing experience, helping others to fight with their diseases. We all have that power and we all can use it to make our life better. The next thing I will remember for a long time is the Quantum Computing session. Microsoft is about to release Quantum SDK this year! The computers are almost ready to be a part of Azure offering, once it is done, we all will be able to benefit from the Quantum speed of calculations. The issue is that programs need to be rewritten to be able to run on the quantum computer. We have to rewrite all algorithms and we will be able to do so using Quantum SDK. Do you know that breaking 2048 bit RSA certificate would take around 13 billion years using a modern computer? The Quantum computer could do it in minutes! It is just a matter of available qubits. This is amazing. So far, we could do the same overlay in games and on the TV screen. But people being on-site couldn’t see the same. Now, thanks to AR and HoloLens, this is possible. Now, we are talking about a real future! There is a concept of storing information using DNA. It is so dense that comparing to our known storage techniques, we would need Two Walmart Supercenters to store the amount of information we could store in a dot on a paper using DNA! Of course, writing and reading data takes a lot of time as this is organic material (most probably nucleoid… if my memory is not cheating). Well, my imagination gives me a lot of examples how it could change our lives. We could have recorded this what we see throughout our lives. This could be stored inside your body so you could rewind to every memory you have. Find more information here <https://www.microsoft.com/en-us/research/project/dna-storage/>, and make sure you see the OK GO movie <http://okgo.net/>, it is awesome. Meeting with the visitors on the stand during the exhibition as well as listening to the keynote speakers gave me a lot of satisfaction. I am really inspired to go further with Augmented Reality, Automation, RPA, Bots, IoT, Machine Learning and many other technologies that could be combined improving businesses, reducing complexity, improving accessibility and providing new experience for the users. The Microsoft Future Decoded is definitely the event you should have in your calendar for the next year. I loved your AR meeting room demo. Do you actually provide that off the shelf? Hi Thom, So far this is our R&D effort showing our passion to new technology and to solve of a complex problems using smart and innovative solutions. We all see great potential in AR and we will further explore this path.